The purpose of the peace process is peace of mind for antisemites. Here's a pix of one of those peaceful peace activists in the Gaza pro-terrorism flotilla. Note the wide-bladed knife in his right hand. Yet, some people in the West think that the circa 800 passengers on the pro-terrorism convoy were all Nobel Prize winners [shame on that Corrigan woman!] and 80 year-old "Holocaust survivors." It is questionable just in what way that woman was a Holocaust survivor. She got out of Germany before the war. [here]. Our bloodthirsty knifewielder appears more clearly and larger with his knife on the ynet, nrg, and Point of No Return sites. 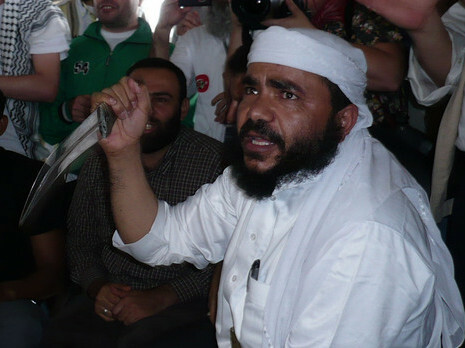 This throwback to the Middle Ages is a prominent activist in the Yemeni flotilla delegation who were three MPs from the Al-Islah party, an Islamist party that is close to the Muslim Brotherhood. Our ferocious hound in the photo is one, Sheikh Muhammad Al-Hazmi. He was photographed on the deck of the Mavi Marmara brandishing his large curved dagger, having just arrived in a time machine from the 7th century.
. . . Bulent Yildirim, President of IHH, in response to Israeli military preparations said, “Let them do whatever they want in order to prepare for our arrival. We are not even carrying one little jackknife. We are purely a civilian and humanitarian initiative. We are not involved in politics . . . . We are not doing anything of criminal nature. . . [here]. The army of Muhammad will return for sure. This is meant to intimidate Jews, threatening them with the fate of the Jews of the Khaybar oasis in northern Arabia who were slaughtered, enslaved, and dispossessed by Muhammad's Muslim forces after a 7th century attack of aggression. The governments now ruling northern Arabia, Jordan and Saudi Arabia, do not allow Jews to live in their territory. As with any Israeli effort at self-defense, taking over the pro-Hamas flotilla sent on its way by the Islamist govt of Turkey has met a huge mass of Eurohypocrisy, especially European hypocrisy, although the Turks too are quite capable of hypocrisy. Now let us look at the main body sponsoring the "peace for terrorists" convoy. It is the IHH (The Foundation for Human Rights and Humanitarian Relief [the initials IHH are based on the Turkish name = Insan Hak ve Hurriyetleri Insani Yardim Vakfi]), which now operates under Turkish govt supervision. 1. Famed French counter-terrorism magistrate Jean-Louis Bruguiere found that in the mid 1990's the IHH president conspired to recruit members for jihad. CIA reports have linked them with extremist groups in Algeria and Iran. 2. Jean-Louis Bruguiere also testified to a U.S. Court that the IHH played a "central role" in the attempted Al Qaida Millenium bomb plot targeting LAX, the main airport in LA. 3. During the Iraqi war, IHH funneled funds to insurgents in a Sunni dominated area of central Iraq. These were funds used to kill American soldiers in Iraq. 4. In December 1997, Turkish authorities began a criminal investigation into IHH when sources revealed to them that the IHH had purchased semi-automatic weapons from Islamic militant groups. Inside the bureau an array of items were found: "firearms, explosives, bomb-making instructions and a jihadi flag." 5. The IHH continue to cooperate closely with Hamas, including joint press conferences and close collaboration regarding the Flotilla. As early as this morning (May 30th), from within the Flotilla itself we heard the possessed cries of the 'peace activists' chanting repeatedly: "Khaybar Khaybar ya Yahud". This chant refers to the battle which took place in Khaybar oasis, 150 km north of Medina in Saudi Arabia, in 628. It refers to a battle – led by Muhammad – which resulted in the slaughtering of 100 Jews combined with the humiliation and surrender of the rest, including the imposition of the infamous poll tax on non-Muslims. To this day the battle is regarded as a model which Islamic extremists desire. According to this model, the Jews have a right to live under Muslim regimes but in return they have to pay taxes. If the Jews go beyond "rules of the game", the meaning is clear. The anti-Semitic chants echoing through the Flotilla this morning were just the tip of the iceberg. Many of the assertions above are documented in these two files below. A Danish think tank [research group] provides data on IHH [here pdf]. Ties between Hamas and IHH are shown and detailed here on the Hurry Up, Harry blog. Note the delirium of the Turkish crowd yearning for an intifada battle with Israel [see video on blog post]. Before the Six Day War the mob in Cairo was likewise delirious in anticipation of war with Israel which the mobs hoped would be the final victory over the Jews. For those who were not around at the time --and for those who forgot-- the mobs in Cairo were carrying large cloth posters with the skull & crossbones painted on them. They were yearning for death, at least for the Jews. "(a) are believed on reasonable grounds to be carrying contraband or breaching a blockade, and after prior warning they intentionally and clearly refuse to stop, or intentionally and clearly resist visit, search or capture;"
"UNIFIL is supposed to be preventing arms shipments to Hezbollah [in Lebanon according to Security Council resolution 1701], but is not doing the job or else the Israeli navy would not have had to apprehend the Francop [a weapons-carrying ship from Iran to Hizbullah]. There is no UNIFIL for Gaza and hence wiithout a blockade the Iranians and Syrians could send basically anything they wanted, including many weapons they can't get through the tunnels, not least of all because the Egyptians don't want, for instance, scuds on their border either. Moreover, the blockade is what will ensure that Iran cannot harden its nuclear program by sending nuclear material to Gaza - as it may very well to Lebanon." Lee Smith is author of the new book about the Middle East, The Strong Horse.